Are the OEM Engine Rebuild Kits Worth It? If you’ve heard of Highway and Heavy Parts, you probably know we sell aftermarket diesel engine parts. But do you know the difference between aftermarket parts and OEM parts? Do you know the difference between stereotypical aftermarket parts and quality aftermarket parts? Maybe you do, but we get a lot of people that call in and don’t. Aftermarket parts are any parts that are not made by the company that made the original parts or engine. “OEM” stands for “original engine manufacturer” and refers to the company that originally made and/or sold an engine. For example, Caterpillar and Cummins are a couple major OEM’s in the heavy duty diesel world. The usual assumption is that only the OEM’s can supply the right parts when you need to work on your engine, or that only they can supply quality parts. Aftermarket parts get a bad reputation for being junk, not holding up, or not fitting properly. But what really is the truth? There’s no denying that OEM parts will fit correctly, but are they really the only good option? The biggest “advantage” of buying an OEM rebuild kit is that it contains the same parts your engine was built with, so you know they’re all good quality parts. You can buy parts for a repair and know that they will fit correctly. This gives you peace of mind, since rebuilds can easily get expensive. This reassurance is the main reason people buy OEM parts when fixing their engines. OEM parts also usually have a warranty associated with them. Most OEM’s provide 6-12 month warranties, which is a decent length of time for a warranty, and which satisfies most people. The OEM’s also tend to have good availability on parts for newer engines. In fact, they’re usually the only option for parts if your engine is very new. The biggest disadvantage to OEM rebuild kits is that they are pricey. As we know from every other type of thing you can buy, big brands are (almost) always much more expensive than their aftermarket or generic alternatives. The diesel industry is no exception, and you definitely pay a premium for the OEM logo on the box your parts come in. Another disadvantage is that, though the OEM’s have the best availability on parts for brand new engines, they have spotty availability on parts for older engines. The older an engine gets, the less an OEM will carry the parts needed to fix it. A big downside to genuine parts that most people don’t realize is that you won’t always get exactly what you think you’re getting. For example, Caterpillar cylinder kits come pre-assembled. They market this as a time-saver, which it is. However, this pre-assembly also hides the fact that the pistons in that cylinder kit may be used. Putting used pistons into cylinder kits is a common practice of theirs, but you wouldn’t be able to tell from the price that only half of the cylinder kit is brand new. They also don’t advertise this fact, so most people just assume all of the parts are new. To get this out of the way, one of the biggest advantages of buying aftermarket kits is that they are almost always much more affordable than buying genuine kits. That aftermarket parts are cheaper is a pretty well-established fact, regardless of the type of part you’re buying. Take a rebuild kit for a Caterpillar C-15 ACERT for example. You can get a Gold Kit from the OEM for $6,552.68, including the core charge they charge you for the used cylinder packs. We offer the basic inframe kit for $3,107.95. To make this kit comparable to a Gold Kit, you’d also have to add the connecting rods, which we have new for $267.86 each, or $1,607.16 for all six. So the total cost of the comparable aftermarket kit for that engine is $4,715.11. That’s $1,837.57 less than the comparable OEM rebuild kit. And, if you’re a repair shop, the importance of pricing matters even more. While price is a huge factor when rebuild kits cost so much, there are many other factors to consider. Some manufacturers only make aftermarket parts, and don’t supply the OEM’s. This can be a good thing too. Many aftermarket manufacturers make just as good quality of parts as the OEM’s or their suppliers do. A few aftermarket manufacturers have even made better parts than the original ones. Aftermarket manufacturers have had the time to improve on the original parts’ designs. These companies are taking the time to study the OEM parts to figure out flaws and how to fix them, which gets you a better part for less. Despite the fact that many aftermarket manufacturers provide parts that have equal quality to the OEM, there’s still such a bad reputation around them that the manufacturers find ways to prove their quality. One of these ways is offering double the warranty of the OEM. Most OEM’s offer 6-12 month warranties, which isn’t bad. But you know what’s better? 12-24 month warranties, which are the warranties most good aftermarket manufacturers will provide. In addition, the aftermarket companies will only sell you rebuild kits with new parts. I’m talking all new parts. They won’t hide used pistons in their cylinder packs, they’ll just sell you new ones. After all, if you want used pistons, you can just buy a re-ring kit and use your own. Aftermarket parts are also available for the older engines that the OEM’s no longer carry parts for. When the OEM no longer carries parts for your old truck or tractor, there’s a good chance an aftermarket company will. All is not roses, and that’s why we have to disclose the ugly reality: there are disadvantages to buying aftermarket rebuild kits. When buying aftermarket, don’t just buy any aftermarket rebuild kit. Not all manufacturers have the advantages listed above, and that’s why you need to be very particular about your parts supplier. A good parts supplier will actually make sure that parts from an aftermarket manufacturer are quality before they will sell them to customers. For example, HHP actually bought the cheap parts another aftermarket seller was advertising and tested them ourselves. We pitted them against similar parts from an aftermarket manufacturer we trust in the Ultimate Battle of the Parts. Those parts that seemed too cheap to be true? They were. That’s why HHP only sells from manufacturers we know and trust. We’ve done business with them long enough that we know their failure rates, what they’re good at, and if we need to avoid certain parts made by them. For example, some of our manufacturers make great gaskets, but not great pistons. We can get you gaskets from them, and pistons from another manufacturer that has better reliability. Another sad truth is that aftermarket manufacturers cannot provide complete availability on parts for newly designed engines. Aftermarket manufacturers cannot design a part that has a patent on it, and it will take a little while to perfect a design that cannot begin to be worked on right away. Rather than rush the engineering process to get parts available more quickly, a good aftermarket manufacturer will take the time to design the part correctly. This means that you may have to wait a couple years to get aftermarket parts for you brand new engine. There’s no denying the quality of OEM parts; they got their big names for a reason. However, if you don’t want to be overcharged and you have a good supplier, aftermarket is the way to go. You can get the same or better quality, with twice the warranty, at a fraction of what the OEM would charge you for the same parts. However, we cannot stress enough that you need to get the right supplier. A good parts supplier will find you those quality parts, and steer you away from the cheap manufacturers that gave aftermarket parts their bad reputation in the first place. 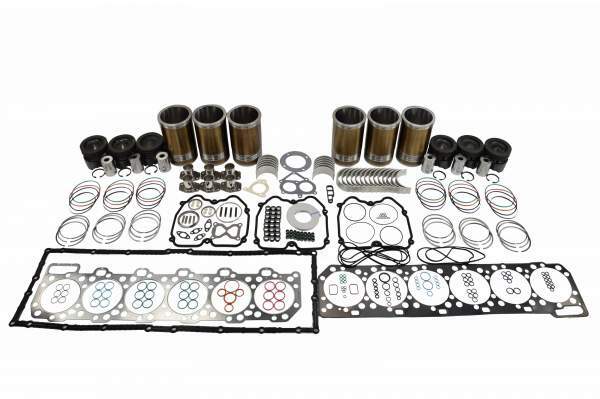 Want to know more about our aftermarket rebuild kits, or get quality parts at a lower price? Call Highway and Heavy Parts at 844-215-3406 or request a quote online today!